A very blue shaded Orc could be seen coming from a distance toward the tall blood elf, a spear across her back. Her hand shot up and she waved before breaking into a run to get to the man, a grin on her face. Beside her, fading in and out of sight, possibly this plane of Azeroth, was a large purple Warpstalker. "Varethyn!" Searsha was quick to call out to him, when she was just about in hearing range. She'd wait until she got closer to say a proper hello. Which, thanks to her running, took about twenty seconds, give or take. "Hey! It's good to see you again. How've you been doing?" Searsha! Hey, it's been a little while. I've been fine, for the most part. Nothing worth complaining about. Honestly it's been more weird than anything as people have suddenly started talking to me and asking questions. It's not so bad actually. It's helping me get better at being around others. Ah! I forgot! I was going to get Kithren and Banét to come out and meet you. You were? Well, here I am. Who's your friend? This is Searsha. We travelled with her parents that time. Huh, how about that. In that case it's nice to meet you, kid. But hey, why so blue? There's no need to feel that way around us! "There are some who fight for the wildlife... but greed is sadly greater. A species of Rhino just went extinct, there are more plastic in the oceans than fish... people kill gorillas to use their hands as something they call ashtrays..." Tårnfalk stops, look at the ground and kick the dirt. "...And I don't have the heart to tell about the many other sad things... there are some good things too though. Just like there are good and bad things. That's kinda why I build wormhole generators. I hope one day to find a better world. And Kith I agree that Earth is kinda a silly name. Some call the planet Gaia. I like that. I don't know if they destroy it just to destroy it... but most are unwilling or due to poverty unable to change their way of life, which often comes as an expense to nature. I don't think it's a human thing only though. I've met both elves and dwarves with the same attitude. I think sadly it's due to a lack of interest in others and only focusing on one self. ...or they are too poor to be able to do anything about it." Tårnfalk pauses. "Ohh well enough of all the sad things. We need cheering up. Any suggestions boys. What do you do for fun ? " Yeeeaaah no thanks. This place is bad enough with all the wars we keep having. In-fighting, faction wars, demons, undead... I've seen enough wars to last a lifetime and I've still got a looooong time yet. Light knows what else is gonna happen in the future. Gaia's a nice name. I like that. But yes, let's move on. Fun for me is travelling the world and learning about the wildlife. I've been to the end of each Azerothian continent and back a few times and still find new things to explore. I was so excited when Pandaria was discovered. I think that's my favourite place to visit so far. Other than exploring there's the animals of course. As a hunter and even not I've found I have a special connection with wildlife. However, when I'm not wandering or meeting animals I do actually enjoy wood sculpting. ...not that I'm really good at it or anything. I simply find it relaxing to make shapes in random pieces of wood I find strewn about. Argorok sometimes finds driftwood for me when he goes fishing too. I'm a pretty simple guy. I enjoy chatting with people, especially in taverns and the like. It's even better when alcohol's involved. I like me a good pint or so of whatever's going. I've been cutting back since I have a family though, but that's okay cos I love playing with the wife and kids too. ...hm... I wonder if any plans have been made for tonight. What's a memorable moment for you two? Good or bad, whichever you'd like to share. I have many memorable moments with my pets, though if I had to pick I think finding Argorok's egg and when he hatched are the ones that stick with me the most. The fact that his egg was intact after a lynx destroyed the rest of his nest was pretty amazing, and watching life emerge from it a few days later is something special to be sure. ...The most memorable moment I have at all was seeing my homeland being destroyed by the Scourge. I was out hunting at the time and started hearing screaming. When I got to Silvermoon so many were dead or dying or fighting with the undead. Including my parents. I... saw them die. It gave me nightmares for years. I still get them every now and again. I think the destruction of Quel'thalas is going to haunt high and blood elves for a long time yet. I was lucky enough not to be there for the attack itself but I did rush there when I found out. It had been years since I'd been there yet seeing it like that was so painful. I... also have a lot of bad memories growing up that I'd rather not discuss right now. Best moment? Gotta be when I got married. I've always been the flirty type and chat up women all the time, so actually meeting someone I legitimately cared about and who cared for me was a massive surprise. Getting married was something that never crossed my mind. Ever. Yet here I am, happily married with two kids. I often think that I don't deserve anything like this, but hey, if the Light is still happy enough for me to use its power despite it all then I guess I shouldn't doubt it. "Wood sculpting? That sounds very relaxing. I would love to see your work if you would allow me." Tårnfalk smiles. "Heh Kith I like alcohol too... My favourites are wine and something called Baileys... what's yours? I am also married and my husband will have dinner ready for me tonight. No kids though." Tårnfalk pauses and look at Varethyn. "If its not too personal a question are you married too?" Ah... like I said I'm really not that good. It's something I do to pass the time more than anything else. More often that not I leave what I made at the place I camped. To let the wood rot into the earth. It makes more sense to me than carrying it around. If I manage to make something I'm particularly happy with I'll keep it and show it to you. A good brew will do anyone wonders. I don't do wine a lot, mostly at home. I prefer good ol' beer or ale... don't really have a favourite as such, anything that packs a punch does the job. I can say that those dwarves are masters at what they do. I've recently taken a shine to Pandaren brews too! I think I've heard of Baileys. That's that creamy stuff right? I wouldn't mind trying it sometime. Married? Nah, not me. I don't even have someone I feel that way about. There are a few people I'd like to know better but for right now, it's just me. He's married to his pets. Searsha looked pretty content to talk to her friend and perked up at the idea of meeting someone else that her parents had been traveling with. She looked to Kith and was about to say hello, but then that pun came out of him. Her expression immediately slipped into one that mirrored Varethyn's wonderfully. "You know.. I'm starting to think that parents get this book, mostly the dads. A book of horrible, horrible puns." She sighed before she shook her head. "It's nice to meet you either way!" Hah yeah, I've seen that too. My dad was bad for jokes as well. I guess there's something about having a family that makes guys want to be sillier than normal. Searsha, was it? Nice to meet ya. Seriously though, I don't think I've ever seen a blue-skinned orc before. You do remember Asli and Magna, don't you? So lost in her thoughts, Vyonne failed to notice the encroaching shadow around a corner and, upon turning on the inside, the Nightborne immediately collided with another body. Jarak's startled squawk drowned out Vyonne's gasp of sheer horror at what she'd done and, fearing that it had been a member of the alliance that she'd accidentally knocked over, Vyonne ignored the dirt on her robes and instead offered a slender hand down to the figure on the ground. Looking confirmed that it wasn't a member of Alliance that she'd bumped into, which was one good thing about the situation. Even then, not all of the Horde were accepting of the Nightborne, which was something Vyonne was growing accustomed to. "I do apologise, sir," she said softly, doing her best to offer the other a friendly, albeit uncertain, smile. "I was completely lost in my thoughts and not paying attention. Dalaran is such a beautiful city, I-" Vyonne caught herself before she ran her mouth too much and let out a merry laugh that held a nervous edge to it. "I really am sorry. Are you alright? I didn't hurt you, did I?" Huh? Ah... it's okay. I wasn't paying attention either. I hope you're not hurt at all. I'm... kinda used to it. You're one of the Nightborne, right? Sorry, I don't know much about what happened in Suramar. But I heard that your people aided ours in fighting the Legion. It's good to see you exploring outside the city. Um, is your pet okay? I think we might have spooked him a bit when we bumped into each other. Last edited by Varethyn on Mon Apr 09, 2018 6:37 pm, edited 1 time in total. Tårnfalk laughs. "Heh I don't think either. And yes Kith, Baileys is that creamy stuff. I really like it. My husband is more partial to beer and something called Malibu, it´s basically alcohol with coconut in." Tårnfalk cringes at the thought of it. "Not my taste exactly. But my husband don't mind. More for him he used to say. Varethyn, don't feel bad that you are not married. It is not always easy, though I feel like I got lucky. I hear stories and am very thankful that my husband is so mild and loving. I totally understand the bond to pets, I love pets. You connect to them like children I say. More than spouses anyway... well for me anyway... Won't judge against your preferences Kith." Tårnfalk smiles in a joking manner and winks her eye. "Speaking of drinks, do you guys want to go to a bar or something... ohh I forgot .. Varethyn do you drink?" Niiiice I gotta meet the guy some time. Those "other world" drinks sound amazing. You know what else sounds amazing? That offer. Pay the tab and you got a friend for life! Um, well... To answer both questions, I'll join you in going there but I'd rather not have anything. Not alcoholic at least. I admit I've not been very adventurous with it but what I have tried didn't taste right to me. I think the most I've had is a type of wine mixed with fruit juice. As for the marriage thing. I don't feel bad. I'm happy as I am with my animal companions. One day in the future? Maybe. If any of my relationships go further than they are now there's a possibility. But for right now I'm content. Vyonne nodded, offering a small smile as she looked Varethyn up and down to confirm that she hadn't hurt him or scuffed any part of his attire. This one wasn't anything like Krysteena at all, seeing as he didn't immediately scold her lack of attention or shoot her a dirty look. Refreshing, even if out of the realms of what she understood of each race. "Oh, yes, I was just here for some supplies for a trip I'm making in a few days with another huntress. Your people proved invaluable in the liberation of our city and I'm very much looking forward to fighting alongside your Horde in payment for what you have offered." It sounded less like something she believed and more like something Vyonne had grown accustomed to repeating and she quickly shook her head after she said it as to dislodge whatever thoughts were making themselves apparent. Blind loyalty was never something she would trust, but unless she acted so, she wouldn't make it by in this new faction she was in. 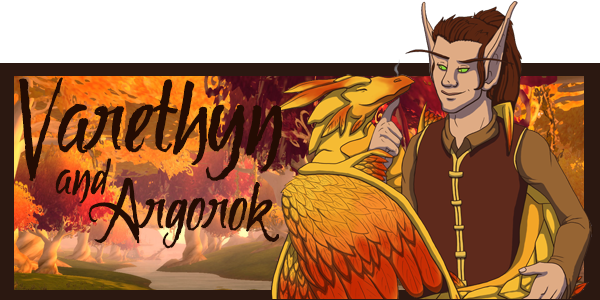 When Varethyn mentioned Jarak, Vyonne turned to look at the hippogryph, who was a few paces away and watching the newcomer with a wary eye. Vyonne cooed softly at the creature and extended a hand to coax him forward a little. "Jarak is alright, thank you. He's just a little flustered is all." When the hippogryph approached enough for her to scratch under his chin, her smile returned for a moment. "Silly boy, you're alright." The hippogryph let out a soft caw as he looked at Varethyn and Vyonne matched his gaze, amber eyes holding a wary curiosity. "He's not going to hurt you, Jarak. That's just-" Vyonne paused, before looking to Varethyn with a small laugh. "What is your name, if I may?" She then asked, offering another smile. "You're not like others that I've met and I'd appreciate a name to remember you by." Vyonne paused, before quickly adding, "I'm Vyonne, if that helps any." 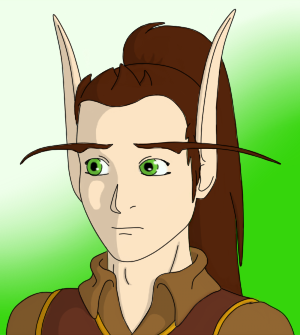 I've heard how similar things have been for the blood elves and the nightborne, even though I wasn't there for it myself. It must be comforting knowing people who have been in the same situations. I'm... not technically part of the Horde. Or the Alliance. People like to think I'm Horde because of how I look, but I prefer to remain neutral. Regardless I'm glad you're finding a place alongside the blood elves. Ah, um... sorry. I tend to get a little carried away when talking about animals. I get on better with them than with other people. I uh, understand why you'd think me different. My name is Varethyn. Varethyn Swiftrunner. It's nice to have met you, Vyonne. Jarak too. "Nothing wrong in not drinking. I have many friends who don't drink. I think it's a matter of taste rather than being a lightweight." Tårnfalk smiles and wink at Kith. "I don't mind paying the tab, in this world I got plenty of money." Tårnfalk smiles. "Lead the way Kith. Ohh and Varethyn I know a lovely non alcoholic white wine if you would like to try that." Which outfit do Kith and Varethyn have as favourites, and do they dress differently on special occasions? Favourite outfit? Probably what I'm wearing now, or similar. Light leather and linen that is easy to move around in. Preferably in brown or green to help me blend in better. When you live out in the wild you tend not to want to be seen, you know? I did try the gear offered at Trueshot Lodge but while it fit nicely I can't stand the sound of the chainmail. I prefer not to draw attention at all so walking around with clanking metal kinda defeats that. Otherwise, not really. There's not been anything special that needed a particular outfit. And if there was I'd probably try to avoid it. You're looking at it! At least when I'm not home or being super casual I'm quite partial to my armour. People ask me a lot why I wear Blood Knight armour when I left long before they got established. The answer's simple: It looks cool. Plus I... I guess I need some connection to my people. 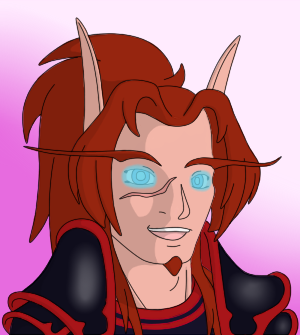 I did think about ditching it when the whole Kael'thas thing went down, but seeing Lady Liadrin and other Blood Knights wearing it out of loyalty makes me feel better about it. For special occasions there is the tux I wore at the wedding. No, I'm not showing you that, it was embarrassing. I hate dressing up all smart like that. Of course, depending on what you consider a "special occasion" there is one other "outfit" I save for alone time with the wife.